Have you seen Dolly Singh doing Yoga in public places? She destroys every myth about thin bodies, beautiful bodies, curvy women, and who should or not be doing Yoga! And since the time I have seen that gutsy free-spirited woman doing yoga, I’ve been wanting to take it to the public places myself and not in a group and not to any park! Alone, by myself and to unexpected places! For me – yoga is always about my focus. My mat. My effort to synchronize with my breath through the postures. Inputs from my teacher. I am supposed to feel, switch off my phone and work on my body through my breath. While practicing – you have to forget it’s hatha, vinyasa, you give it no names, just lot of patience, lot of forgiveness for your own body. The practice is selfless and selfish both. It’s all about Me, I and My! 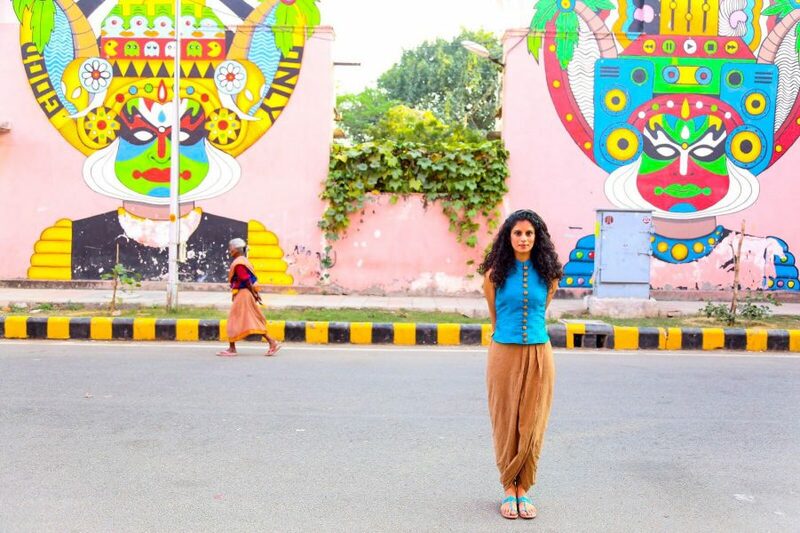 So I decided to step back, relax, carry my tripod, get on the metro, and reach – LODHI ART DISTRICT! Basically – use the quote – doing what I can, with what I have – In a new random place! Time spent on ideating, planning and finally executing – priceless! Living life to the fullest is the only way to live – even if your fullest is someone’s too much or average or below average! We do need streets and crossroads in life, to keep it all exciting, to keep thinking. Because I almost thought I couldn’t do this alone – and I finally did! I feel – ABHEDYA! Abhedya – You might want to check the meaning of this beautiful word here. A year of Running – 2017. Places and Places. Sumeer and THE Negative Splits!